A few years ago, one of my dearest friends, the godfather of my son, lost his daughter Margaux to Ewing’s sarcoma, a rare but vicious bone cancer. Another friend, a well-known author, has lost both a child and a grandchild to the disease. The survival rate for Ewing’s sarcoma that metastasizes is a disheartening 10 per cent. In this age of medical miracles, how can that be? After Margaux’s death at age 14, I dedicated a book to her. Such a feeble gesture. I wanted to do more. Still do. Here’s how. “Flesh & Bones,” the last of the Jake Lassiter novels, was published internationally to wide acclaim in 1997. Out of print for many years, it’s now a 99-cent e-book, with all proceeds going to the Four Diamonds Fund, a charity that pays for treatment of pediatric cancer patients at Penn State Hershey Children’s Hospital. In addition to providing world-class medical care, the Fund supports research in immunotherapy, carcinogenesis, and several other fields I can barely spell, much less understand. I can’t imagine a better charity. This is my second venture into publishing for charity. Last summer, my first novel, “To Speak for the Dead,” was brought out of retirement as an e-book and produced thousands of dollars for the Four Diamonds Fund. That book introduced the world to Jake Lassiter, a linebacker-turned-lawyer who searches for justice but seldom finds it. Here’s a little background about the Four Diamonds Fund. In 1972, a 14-year-old boy named Christopher Millard was an aspiring writer. He’d penned a mythic tale about “Sir Millard and The Four Diamonds,” in the tradition of Sir Galahad and Sir Lancelot. What are those Four Diamonds? Wisdom. Courage. Honesty. Strength. All are needed in our daily lives, especially in children’s battles with a dread disease. Penn State students have contributed an astonishing $78 million to the Fund through their annual dance marathon, which goes by the slogan: “For the Kids.” This year’s event raised more than $9 million alone. One more thing. If each of us can contribute – just a bit – of courage, wisdom, honesty, and strength, maybe we can reach the goal of conquering childhood cancer. “Flesh & Bones” deals with the very real issue of “recovered memories.” In the opening scene, fashion model Chrissy Bernhardt shoots her wealthy father. She claims to have recently recovered repressed memories of having been sexually abused by him as a child. Hired to defend her, Jake Lassiter begins to doubt his client, even as he falls for her. “Another breathless thriller,” remarked the South Florida Sun-Sentinel. “Filled with smart writing and smart remarks,” proclaimed the Dallas Morning News. 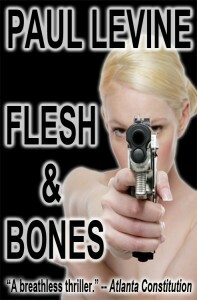 “Flesh & Bones,” priced at 99 cents for a short time, is available on Kindle, Nook, and at Smashwords. More information at Paul Levine’s Website.